Chosen by John Updike as a Today Show Book Club Pick. 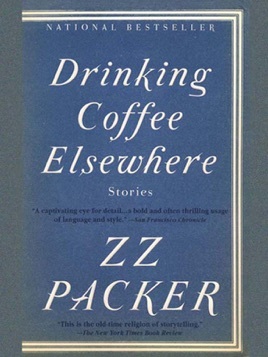 Already an award-winning writer, ZZ Packer now shares with us her debut, Drinking Coffee Elsewhere. Her impressive range and talent are abundantly evident: Packer dazzles with her command of language, surprising and delighting us with unexpected turns and indelible images, as she takes us into the lives of characters on the periphery, unsure of where they belong. We meet a Brownie troop of black girls who are confronted with a troop of white girls; a young man who goes with his father to the Million Man March and must decides where his allegiance lies; an international group of drifters in Japan, who are starving, unable to find work; a girl in a Baltimore ghetto who has dreams of the larger world she has seen only on the screens in the television store nearby, where the Lithuanian shopkeeper holds out hope for attaining his own American Dream. With penetrating insight that belies her youth—she was only nineteen years old when Seventeen magazine printed her first published story—ZZ Packer helps us see the world with a clearer vision. Drinking Coffee Elsewhere is a striking performance—fresh, versatile, and captivating. It introduces us to an arresting and unforgettable new voice. The clear-voiced humanity of Packer's characters, mostly black teenage girls, resonates unforgettably through the eight stories of this accomplished debut collection. Several tales are set in black communities in the South and explore the identity crises of God-fearing, economically disenfranchised teens and young women. In the riveting "Speaking in Tongues," 14-year-old "church girl" Tia runs away from her overly strict aunt in rural Georgia in search of the mother she hasn't seen in years. She makes it to Atlanta, where, in her long ruffled skirt and obvious desperation, she seems an easy target for a smooth-talking pimp. The title story explores a Yale freshman's wrenching alienation as a black student who, in trying to cope with her new, radically unfamiliar surroundings and the death of her mother, isolates herself completely until another misfit, a white student, comes into her orbit. Other stories feature a young man's last-ditch effort to understand his unreliable father on a trip to the Million Man March and a young woman who sets off for Tokyo to make "a pile of money" and finds herself destitute, living in a house full of other unemployed gaijin. These stories never end neatly or easily. Packer knows how to keep the tone provocative and tense at the close of each tale, doing justice to the complexity and dignity of the characters and their difficult choices.